One of my all-time favorite movies is Ridley Scott’s Gladiator starring Russell Crowe, not so much for the acting or the story, which of course are both great, but more for the realistic sense of what it might be like to live in ancient Rome. The opening battle scene is still hands down the best Roman battle I’ve ever seen. So, being such an Ancient Rome nerd, when a new Roman novel drops into my lap I can’t help but get excited. 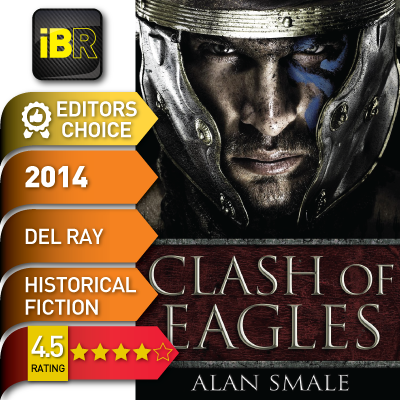 Clash of Eagles is Alan Smale’s debut, but don’t let that scare you off; Smale is a prolific writer of short stories and novella’s, so the step up to a full novel looks to be an easy transition here. Sitting in a fairly new genre for me, Ancient Roman Alternative History, the story is set during AD 1218 in a world where the Roman Empire did not ever fall. The Roman Empire in the Clash of Eagles has conquered territories all the way up to Scandinavia and as far down to the eastern Sultanates and is seeking to expand its reaches from sunrise to sunset. We center on the journey of Roman Praetor Gaius Publius Marcellinus who has been given charge of the 33rd Legion. Gaius and his newly formed legion have been ordered, by the young and brash Imperator Hadrianus III, to follow tales of huge mounded cities from captured Norse pirates. They cross the ocean via Vinlandia and travel to the Evening Continent or Nova Hesperia in search of gold for the empire. Once there Gaius and his legion must traverse across the continent from the coastal plains, over the high mountains and into the flatlands beyond in search of the fabled golden city. However, they soon realise the native population is neither as easily subdued, nor as backward as they had expected. Harried along the way by an endless series of sneak attacks on their flanks, the 33rd legion eventually marches their way to a show down with the mound builders of Cahokiani. How will a copper age city defend itself from the steel and military discipline of a Roman legion? The future of the continent hinges on the outcome of the battle. Immediately we’re shown the great attention to historical accuracy that Smale lavishes on the story, well as much as alternative history can be accurate at any rate. The march inland is intricately described and with such detail that you really feel you’re there with the legion as they create a walled town every night, just to knock it down in time to march the next morning. Not that this detail slows or impedes the story at all, the legion’s march, like the story, draws you deeper into it every mile they trek. The interaction with the natives is also very well done, just how do the stone and copper age tribes deal with the technological might of the Roman Empire marching through their lands. If you haven’t guessed where they are I’m not going to tell you, it’ll spoil the reveal when it dawns on you. Smales creates a very compelling narrative that moves quickly and relentlessly forward and explores quite an enticing “what if” scenario. The world is described vividly and with great detail and you get a sense of connection with both sides of the tale here, the dangerously far away from home legion and the dangerously out gunned locals. The only real issue I had was that the apart from the lead character Gaius, some of the other important characters are a bit light, not quite enough time is spent developing the whole cast here and it can show at times. This is just a minor gripe as we're got a ripping tale here, not a character study. Really one of the best Roman adventures I've read in quite some time, I’ll be keeping an eye out for the sequel due in 2016. In the meantime if Mr Scott and Mr Crowe will kindly make this book into a film I’d be a happy person indeed! Recommendation: Fantastic Roman adventure, don’t be put off by it being Alternative History, the premise is worth the read alone, the detail and cracking story just make it even better.